Three times in the last three months, David Tingley's watched on security video as his Dodge dealership in Redwater was broken into. 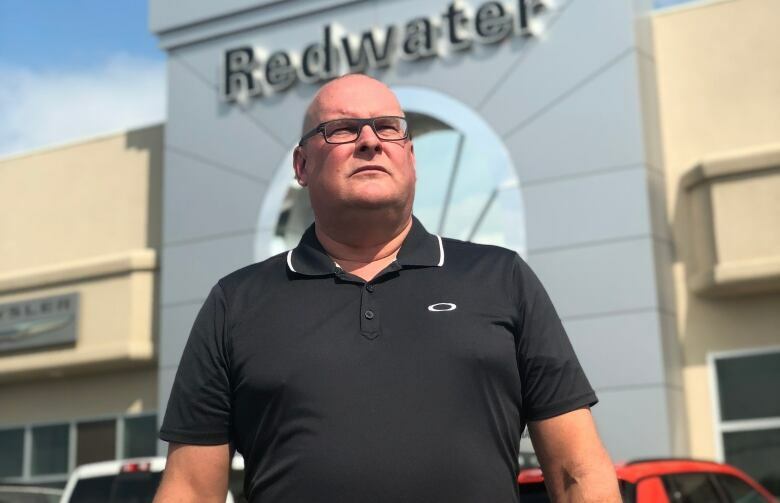 Three times in the last three months, David Tingley helplessly watched security video as his Dodge dealership in Redwater was broken into. After the latest break-in, he watched as the thieves made off a power washer and three sets of expensive tires. Each time he filed complaints with the RCMP to no avail. This time Tingley decided to take matters into his own hands. Tingley posted the security video of the theft on Facebook and before long the Redwater community responded. Tingley received numerous messages from people who recognized the thieves. "We were certain who these folks were," Tingley said. "There was no doubt at all." Instead of going to police, Tingley went to the home of the alleged thieves with a few others from the dealership. While his colleagues waited on the street, Tingley knocked on the door. A voice inside the house directed him to the backyard. He made eye contact with a man in the backyard and asked him if he had tires for sale. The man led him into the garage. In the garage, he recognized some of his property. "I could see that they were welding the Honda motor off of my power washer onto a go-kart," Tingley said. He also recognized the stolen tires. He found the automatic garage door opener, pressed it and alerted his backup. "I hollered to my guys and told them to call the RCMP and the RCMP arrived just moments later," Tingley said. "They immediately arrested both suspects. They knew who these guys were." Two men, aged 28 and 29, were charged with multiple counts of breaking and entering, theft over $5,000 and possession of stolen property worth more than $5,000. They were released on bail and are scheduled to appear in Fort Saskatchewan court on Aug. 9. Redwater RCMP Sgt. Ed Bourque said while police advise against a citizen confronting a suspect, he understands why Tingley did it. "I get it. You've got a business owner who is concerned with some of the recent thefts of his property confronting individuals who are involved in this type of activity, certainly none of us would condone that," Bourque said. Tingley said it wasn't about confronting the suspects. Rather, he wanted them to know who they were stealing from. "We're struggling in a big way in the past three years here," he said. "Our customers are hurting and therefore we're hurting. "When someone steals from us repeatedly with absolutely no punishment, it gets to a point where I have no choice but to take action for myself." Bourque said property crime has increased threefold in the past five years. "Our members are doing the best that they can with the resources we have," Bourque said. Tingley said he appreciates the RCMP and their swift response to his call. But with a lack of recourse, he is considering hiring additional security for his dealership. "I hope that the criminals don't come back here," he said. "[But] I don't think this is going to solve any problems."